Disclosure: This is not a sponsored post. We were gifted a pair of shoes for attending Stride Rites Spring & Summer showcase but all opinions and words are 100% our own as always. We love shoes as much as the next person, and to say that we are shoe hoarders is an understatement. Stride Rite has always been a favorite brand in our household, ever since Miguel was a baby which was 13 years ago, Stride Rite was a brand we could always trust. A few weeks ago we got to attend the Stride Rite Spring & Summer 2017 Showcase, and we are here to tell you that if you haven't had a chance to try this brand of shoes, now is the time. 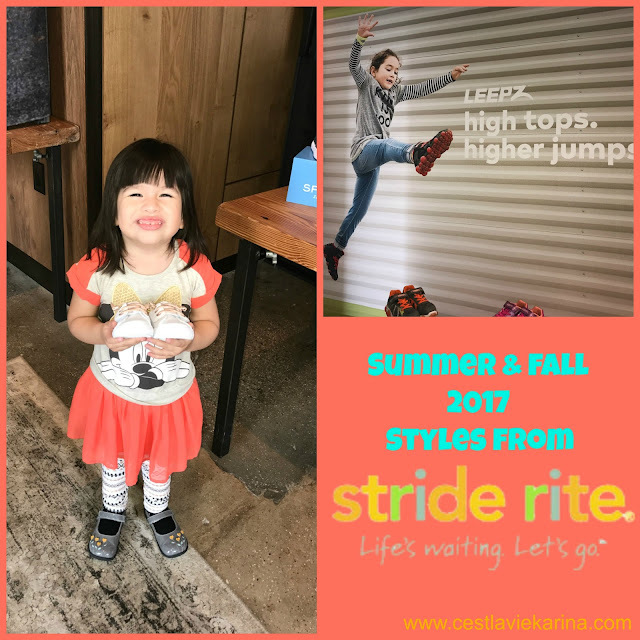 You have to love when a company keeps reinventing itself and changing as the time goes by, before I show you some of our favorite styles from Stride Rite for this upcoming Summer & Fall season, we have to talk about the baby bootie. Stride Rite first introduced their baby bootie in 1931, even though their first shoe was introduced in 1919. I remember my brother using the Stride Rite bootie and how hard it would be to put on the shoe, I'm not lying when I tell you that it wasn't my favorite when my mom asked me help put on my baby brothers shoes. There was no velcro strap to help put on the shoe. I had to wiggle his little foot to get it on. Lets fast forward to today and the Stride Rite bootie has been reinvented to feature hook and loop straps that have velcro, they also have the softest cushioning ever. Perfect for baby toes. It really is hard to pick our favorite pairs, and Valentina is proof of how fun and amazing Stride Rite shoes are. Even though she's all smiles in this picture, you wouldn't know that she had a tantrum a few minutes before. She kept on picking up each pair and saying mine, until she really found two pairs that she refused to let go and insisted on taking home with her right then and there. How I convinced her to let go of those shoes is a little bit of a blur but I think it involved some ice cream and reassuring her that she would get a pair of her favorite shoes a few days later. How cute are these emoji shoes?! With the Emoji movie around the corner these are the perfect shoes to have in hand. Not only that but these are called the Phibians and are perfect for playing in the water during these upcoming Summer days. The Phibians have been around for a while and Stride Rite has reinvented them to feature a cool mid rise version that makes them more versatile for wear thought the year. They still feature the EVA upper material, quick dry, and secure closure that you find in the regular Phibians. They one in different colors and are available in little and big kid sizes. Now we move on to the Leepz, one o the first pairs of shoes that initiated the tantrum. I really can't blame Valentina, who can say no to light up shoes. Upon lifting this pair of shoes up, you will not believe how light they are. Seriously so light, yet so perfect for the active child in your life. The Leepz offer great cushioning for kids feet and fun will provide hours of night time play. The Leepz are also available in different colors for little and big kids. Definitely a great pair of shoes for running around the park. Not only did we get to see the latest styles from Stride Rite but we also got to check out the latest styles from some of their other brands which includes Saucony, Merrell and Keds to name a few. The above Saucony was when the tears started coming down hard, Valentina insisted in taking the purple pair home with her. She loves the color pink but her heart was set on the purple pair. These definitely make for a perfect mommy and daughter matching shoes post. They are so soft and well cushioned, plus look at that velcro closure. No more struggling to put on those shoes. Our kids feet are worth the investment, and your kids will thank you. Make sure to check out Stride Rite shoes and some of their other brands. But in the meantime check them out on Instagram, Facebook, Twitter, and their Website. Also stay tuned to a review, where we will share more information on sizing and how comfortable Stride Rite shoes really are!